Approximately 4 months ago I sold my 2010 Volvo C30 and purchased a 2013 Honda Accord EX sedan. I actually loved my Volvo, and I loved the stereo system in it even more (build log here) but my wife and I were expecting our first child and I needed something a little more practical. After driving every sedan under the sun, the new Accord was hands down the nicest in my price range. I convinced myself that I wouldn't miss the stereo system and would just get by listening to a stock stereo. I made it about 2 weeks before I started planning my new installation. 1) Achieve good sound quality using primarily factory locations and a simple 2-way front stage. 2) Learn to build and properly tune a ported subwoofer enclosure (I have always done sealed or IB). 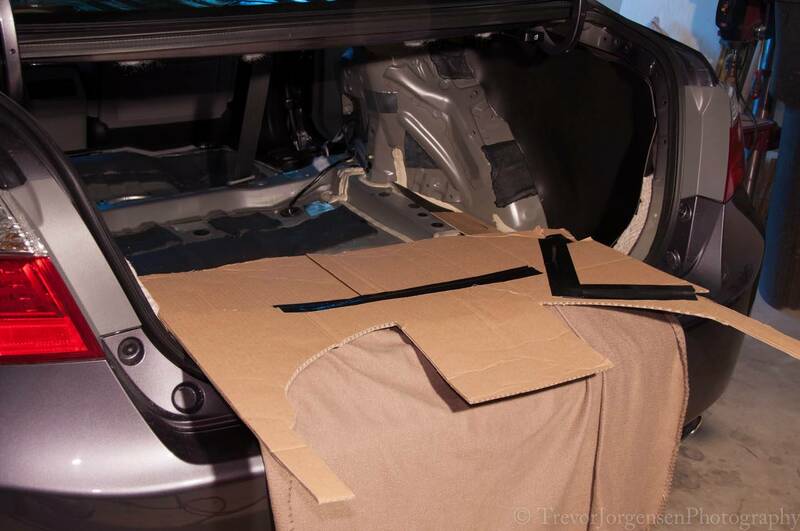 3) Be able to return the car to stock relatively easily. 4) Maintain serviceability of the vehicle. 5) Respect the original design of the vehicle interior. I want everything to "look like it was supposed to be there." 8) Finish in time for my first sound quality competition (IASCA event June 8th, 2013). 9) Retain the spare tire, tools, and ability to access them. I am definitely not an expert. What I lack in experience I try to compensate with persistence. I post a lot of photos with my builds, it helps keep me honest and details my thought process, for better or worse. I encourage and embrace feedback from the multiple talented individuals here. Here is my core gear list. This doesn't include a lot of odds and ends such as wiring and sound deadener, but it gives a general idea of what's going in the car. Here is my proposed system layout. The only unknown at this point is whether I will be running a three way center channel using a Vifa NE85W that I picked up. If space will allow I will do this. This is, therefore, not represented in the diagram. I will be running the entire system off the rear outputs of the stock head unit and will be running two full range drivers off the front channels of the stock head unit. These will be mounted in the top of the doors, near the handles. This will allow me to run bluetooth calling out of these full range speakers only and not through the entire system. It will also allow me the potential flexibility to convert the system to a three way front stage should I get the itch in the future. Oh, and I will be running four eight inch subwoofers . 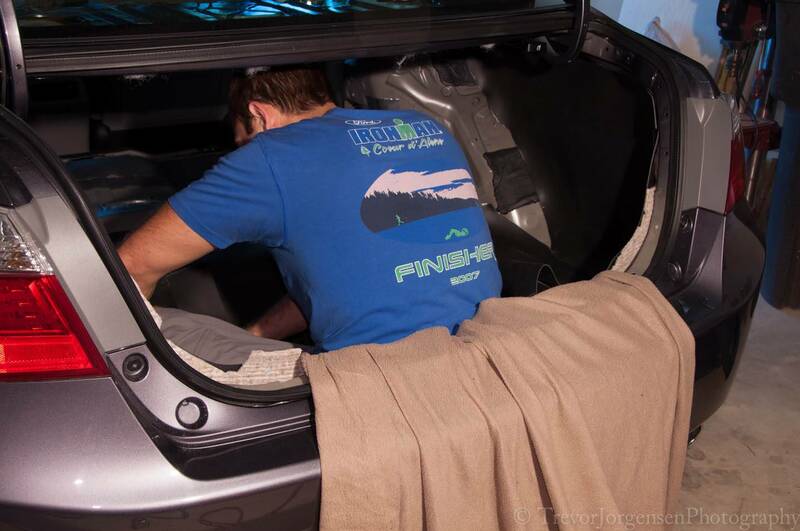 The subs will be mounted as pairs in two custom ported enclosures in each side of the trunk. The front and rear speakers will be in stock locations, but with some twists. The center channel… well I will have to keep you in suspense there . 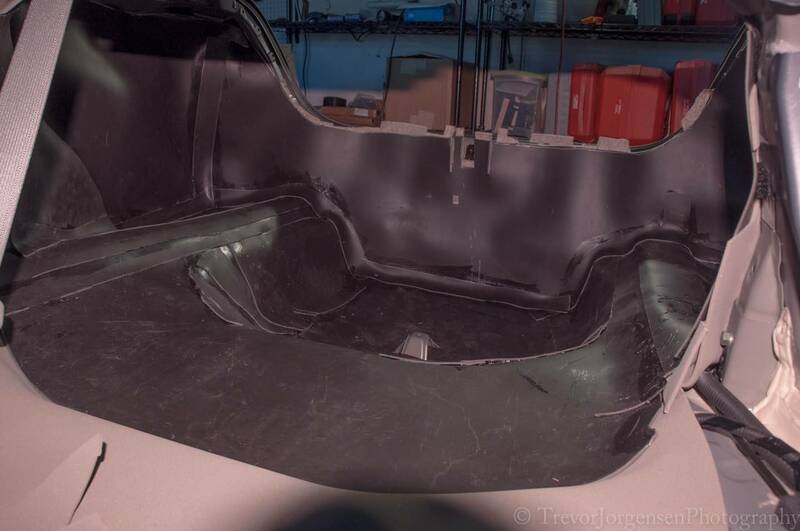 The amplifiers, processor, and wiring will be mounted in a false floor built into the trunk. I will do two pairs of fans in a push-pull configuration to handle cooling. Last edited by trevordj; 05-03-2013 at 09:53 PM..
Last edited by trevordj; 05-02-2013 at 11:14 PM..
Subscribed, as my wife is also a physician. Congrats on the great news about your forth coming baby. Everything. I gotta send a big thank you to Don (RudeBoy) at Sound Deadener Showdown for his assistance with formulating a sound deadening plan for the project. The gear I purchased from him is top left in the photo. The only thing not pictured is the 160lb package of mass loaded vinyl. It was too unwieldy to pack into the garage for this shot. Last edited by trevordj; 05-03-2013 at 01:22 PM.. Thanks a lot! He was actually born on 04/21/2013 so I am running on pretty much no sleep . My wife is awesome though and she is letting me work in some time for this project as she can. Monoprice RCA Connectors: I'll be using these with some Gepco 61801Z wire, tech flex, and some heatshrink to do custom, DIY RCAs. They are super easy to build, and I can make an RCA cable for a couple bucks that kicks the pants off anything available commercially. Various raw materials including fiberglass, carbon fiber, resins, mold release agents, etc. You can also see my ridiculous collection of detailing supplies. Last edited by trevordj; 05-02-2013 at 11:21 PM.. I started deconstruction of the car today and installing some sound deadener. It's late and I have to work tomorrow so I will update that tomorrow. Last edited by trevordj; 05-02-2013 at 11:27 PM..
Best of luck with the build. Are you aware of the headache people are having with aftermarket stereos and Honda's active noise cancellation? While you're tearing the car apart, it may be a good time to disconnect the ASC module. Thanks for the heads up. Yes, I am aware of the need to disconnect the ANC module. It will be a relative piece of cake though. I will be pulling the headliner to sound deaden the roof so I will have to disconnect the ANC microphones at that time anyway. I'll leave them disconnected when I put everything back together. 2013 Camaro 2SS 1LE - HLCD Coming Soon! Thanks Matty. It is definitely similar to my last build simply because I loved the way that car sounded. I just had to set a limit on the spending. I really want to focus more on the build quality and use of composites in this build over high dollar components. I still have some ideas up my sleeve though. If everything turns out the way I envision it, it should be super cool when it is done. And those Vifa mids are REALLY nice. Well, this is the most boring part of the build... sound deadening. There isn't a whole lot to show but I will post some pics of the little progress I made. This stuff always takes longer than I expect. I am going to rally this weekend and try to finish up all the deadening by Monday so I can actually get into the fun stuff. First some measurements. I used my iphone and Dayton IMM-6 calibrated microphone to take some measurements prior to making any modifications. I want to be able to quantify how much a difference the sound deadener makes. These are all a-weighted RTA measurements. All measurements were taken with the windows up, stereo off, and the heating/AC off. 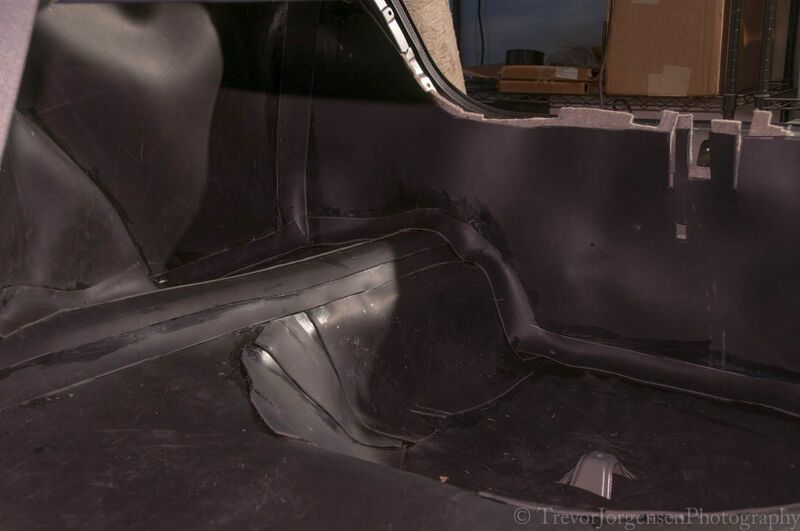 I will refer back to these measurements after I finish the sound deadening. It doesn't look pretty, but all crevices were stuffed with jute padding and polyfill. Some places needed to be secured with a bit of tape until the carpet is replaced. The rear deck was treated from above and below with enough alpha damp to take care of any resonances. The rear seat platform was also treated. Luckily the Accord comes with a ton of factory sound deadener so overall panel resonance isn't a huge issue along the floor. 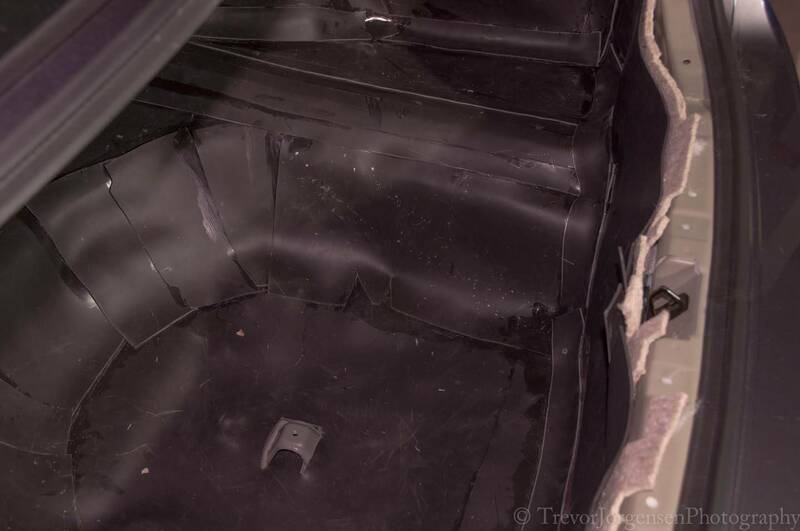 The rear deck was treated with a layer of closed cell foam. Everything was mocked up and fits well. No obvious resonance remains from the panel or rear deck. First mission complete. 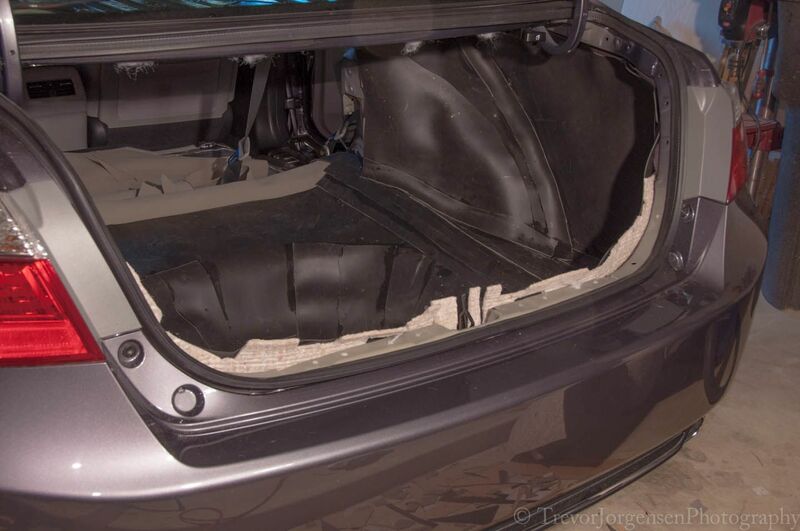 Tomorrow... more sound deadening. I'm hoping to get the rear of the car covered in CCF and MLV then remove the roof panel and front seats to start deadening there Sunday. nice shop setup! I would be happy with that as my main rig. Good luck with the build. It looks good so far. Little off topic, but what other sedans made your short list? Also, you'd recommend the orb speakers? The orbs are nice speakers given their form factor (ie they have a high WAF... Wife Acceptance Factor). We have them in our living room and and back patio as well. They kick the hell out of similarly sized speakers but cannot compare to the sound of a floor stander with multiple sized drivers. I will set up a different home theater set when we move in a year and I can have a dedicated home theater room. The last two days have been slow going. I always forget how time consuming sound deadening is. The bad news is that I didn't get as much done as I wanted, but the good news is that the trunk is now completely deadened. For almost every piece of mass loaded vinyl I have to cut a cardboard template and then transfer it to vinyl. Then I have to cut the closed cell foam including cutting windows to allow the industrial strength velcro attached to the MLV to stick to the panel through the foam. If any of you have any tips how to do this more efficiently I am all ears. 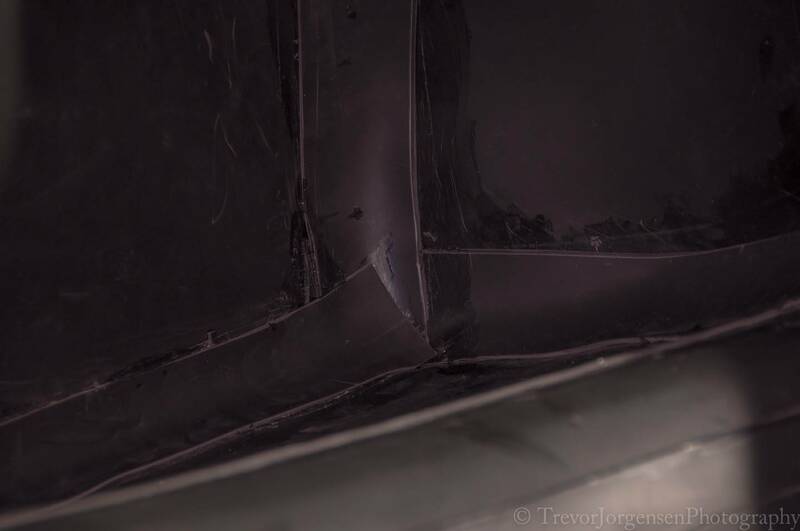 Here is a video of the rear quarter panel resonance after treatment (for those who haven't done this before). Sorry, once I get through this sound deadening I will get to something more exciting. Thanks for looking.